Older people are not only taking more drugs, they are also taking more over the counter preparations. Many over the counter supplements touted to improve health are in fact dangerous when mixed with some medications. In a study published in the Journal of Internal Medicine, two- thirds of older adults were using dietary supplements which included vitamins and herbs. Some of these products, even those that sound natural, may interact with medications. In fact, a study of interactions in 2010 found that 15% of the individuals had a major drug reaction. Fish oil, vitamin E, Coenzyme Q10 when taken with Coumadin may increase bleeding risks. Saw Palmetto, popular for benign prostate enlargement, should be used with caution with medications prescribed for prostate. Melatonin, a natural hormone that helps to regulate sleep/wake cycles, should be avoided with antihistamines or muscle relaxers. Use the same pharmacy for all your medications and inform them of any over the counter medications you may be taking. Take your list of medications, including supplements, to all your physician appointments. 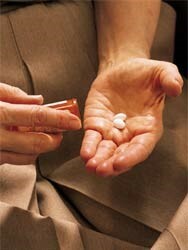 Evaluate the benefit and risk of any medications or supplements taken together. Do not use outdated medication or medications borrowed from your friends. It is important to remember that the best way to reduce a possible drug interaction is to cross check your medication and supplements with a local pharmacy. They have the ability to run the profile through a computer system for a medication interaction check. Lori O’Connor, MSN, APRN, is a national certified Professional Geriatric Care Manager with Elder Care Consulting, LLC. For more information contact us at www.eldercareconsultingllc.com 860-643-9500.